Have had these boots before and they never let me down. Good in all weathers. Always warm and dry. These boots are a Christmas present for our daughter so I havent unpacked them. I have been assured that if for any reason they are not suitable (which I doubt) then I can return them in the extended return period in January. Excellent service. bought as a gift for my daughter excellent fit and great look about them! Ordered pair of Toggi walking boots fast delivery and best price on internet. Great service and quick delivery! The back of the shoe is a bit hard so wear them in gently to avoid blisters. Size is accurate and would order from here again. Great communication and prompt service. Lovely pair of boots and the cheapest found on the web. Lovely boots. Maybe a little tight for the size but I think they will give in time as they break in. very happy with boots fit nicely. delivery was quick and at the time stated by courier. Stunning boots much nicer in the flesh my partner was over the moon and thinks these look miles better than the more expensive ones. Great product and great service would highly recommend. Really lovely boots that are exactly what I wanted - warm, waterproof and good looking. I usually take size 5 but found that 5.5 was much easier to get on and left plenty of room for thick socks for extra warmth. The padded insole feels really comfortable underfoot too. The Uttings staff were very helpful and efficient as well, thank you! 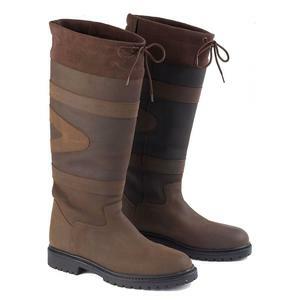 Excellent boot, allows your feet to breathe. I got a 6 as a 5.5 wasn't available and feel it's a bit big for me. takes a bit of time to wear them in as aroung the ankle is quite hard and can cut in if not wearing thick socks, though it can be a bit of a struggle to pull them on if thick socks are worn.